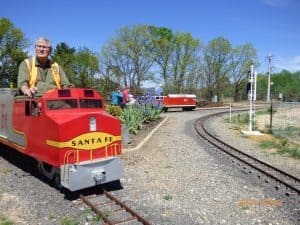 The Canberra Society of Model & Experimental Engineers Inc.is a not for profit organization formed in 1973 to promote model engineering in the Canberra region. Various specialist groups operate within the society, covering a diverse range of subjects and catering for the particular preferences of the members. These groups include Railways, Boats, Tanks, Stationary Steam Engines, Traction Engines, Workshop Machinery. The Society has presented many public exhibitions of projects constructed by members and is an active forum for discussion. It provides a valuable resource from which the model engineer can draw. Members from the the complete novice to the skilled tradesman all benefit from the exchange of ideas, common within the membership. To become a member of the club, fill out a membership form [pdf] and return it either by hand (on a running day or monthly meeting night) or contact the Secretary. The Society holds a general work day every Wednesday at our Symonston site. Activities include track laying, production of track panels and turnouts, signalling, preparation of track bed, general maintenance of locomotives and the grounds plus much more. There is also a small group who attend on Mondays. We are always looking for volunteers to come and help. If you feel you would like to come and join in then give the Secretary a call on 0433 714514 or alternatively come out to one of our work days. There is always something to do and your help would be appreciated. Our monthly meetings are the chance Society members have to share ideas and projects with one another, discuss all aspects of the Society and hear reports from the Executive. These are held on the third Thursday of the month at the Society’s facilities located at our new site 501Jerrabomberra Avenue, Symonston. The meeting starts at 7:30 PM. Visitors are welcome and meetings often feature interesting guest speakers. The monthly meetings are a great time to get to know or have a chat with other club members, learn a few things, and dip into the pool of knowledge that exists amongst them.